VANCOUVER, BRITISH COLUMBIA--(Marketwire - Dec. 10, 2012) - Indico Resources Ltd. ("Indico" or the "Company") (TSX VENTURE:IDI)(OTCQX:IDIFF) is pleased to provide initial drill results from the Phase 2 drilling campaign at the Ocaña Cu-Au-Mo porphyry in Arequipa Region, Southern Peru. The Phase 2 programme, now complete, tested the thickness and grade of sulphide and oxide supergene mineralization intersected by two holes in Phase 1, delineated higher-grade hypogene zones that occur mainly within the breccia target at the centre of the system, and extended the southern and eastern edges of both hypogene and supergene mineralization. The supergene mineralization is the main target, as it is amenable to low-cost, acid heap leaching, based on soluble copper tests on core samples from two Phase 1 drill holes. All 19 holes of Phase 2 have been completed, with assay results received for the first 7 holes (Table 1). A total of 4733 metres were drilled (Figure 1). The supergene target was successfully tested by six vertical holes along the crest of the southern ridge and expanded into the centre of the system by three angled holes (OCA004, 5 & 6. Under the southern ridge, the supergene blanket is consistently approximately 50 metres thick, dips to the west subparallel to the ridge crest, and has an east-west dimension of over 700 metres, with a width over 200 metres at the west end, increasing to 400 metres on the east end. Under the central part of the system the blanket averages about 30-45 metres thick and thins to the east as the slope steepens. The blanket consists of copper oxide and sulphate minerals near the top, grading down into dominantly chalcocite at the base, where it transitions sharply to hypogene chalcopyrite mineralization (Figure 2). 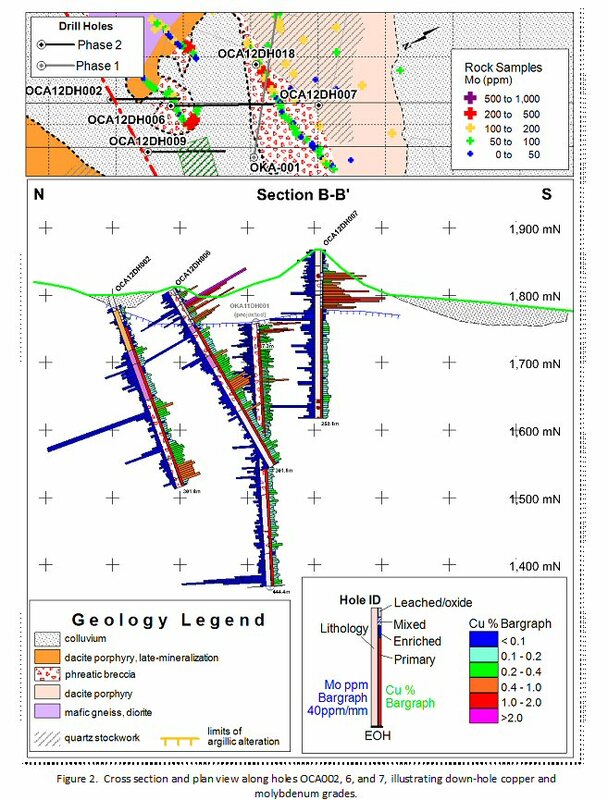 This programme also intersected the strongest hypogene grades yet encountered on the property, with the highest grades occurring in the eastern half within the east-west trending breccia. The breccia comprises mostly fine diorite (diabase) fragments with dacite fragments increasing toward the contact with the main dacite host rock. The highest copper grades are within strong potassic alteration with a weak to moderate quartz-sericite overprint. Significant gold grades accompany the copper within the breccia (see Table 1), for example, OCA004 which intersected 264 metres of 0.36% copper and 0.15 g/t gold, including 39 metres of 0.69% copper and 0.20 g/t gold. Hole OCA005 intersected 111.5 metres of 0.5% Cu and 0.12 g/t gold, or 0.67% Cu Eq. 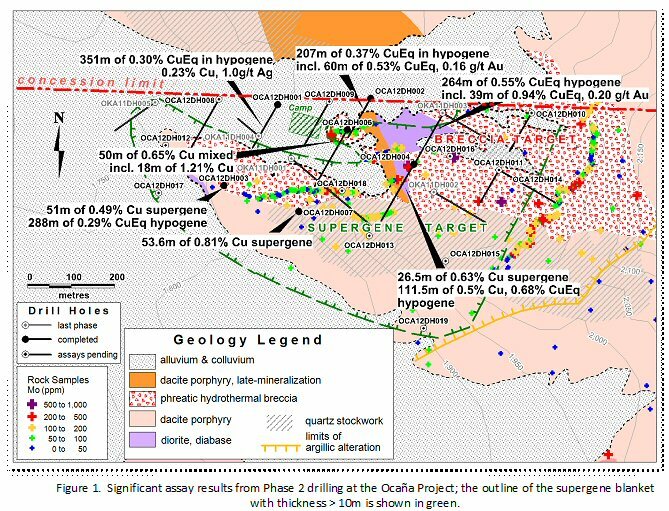 Bob Baxter, President and CEO commented, "We are extremely pleased to have seen the high grade copper results in the oxide and supergene enriched zones overlying the sulphide mineralization at our Ocaña project. Oxide copper discoveries have not been common in recent years. We believe it is important that additional drilling be undertaken in 2013 to further delineate the high grade zones and define a resource that is amenable to SXEW processing. We are also delighted to see the consistency of the gold credit along with good copper mineralisation in the sulphide mineralisation. Further drilling of the sulphide mineralisation will allow for definition and proper modeling of the higher and lower grade mineralisation in order to calculate a NI 43-101 compliant resource." Analytical accuracy and precision are monitored by the analysis of reagent blanks, certified reference material, and duplicate (coarse rejects and quarter core) samples. Indico inserts blind certified reference material at regular intervals (1 in 20) into the sample sequence by field personnel in order to independently assess analytical accuracy. In addition, representative blind duplicate samples are routinely forwarded to Acme for additional quality control (1 in 20 coarse rejects, and 1 in 40 quarter core). Quality control is further assured by the use of certified reference material inserted 1 in 20 samples. Multi-elements were assayed using Acme's 1E package which includes 4-acid digestion and ICP-ES finish; samples with >1% copper are reassayed using an atomic asorption (AA) finish. Lower detection limits are as follows: Cu >0.001%, Mo >0.001%, Ag >0.5g/t . Gold is assayed by fire assay, in which fusion of a 30-gram aliquote is followed by AA finish; with a lower detection limit of 0.005 g/t. Acme has an 9001:2008 and 17025 International Standard Organization rating.